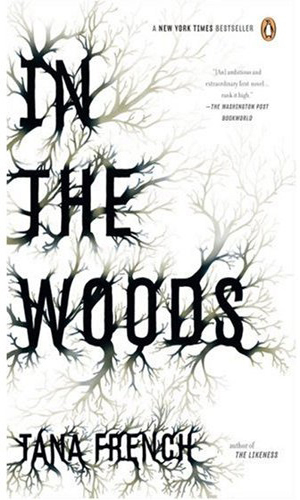 It’s important to note that In the Woods was Tana French’s first novel. Not only was it warmly received, but it spurred another four murder mysteries that also did well on the market. I’m encouraged by this, especially since the word count of In the Woods surpasses the average for first time novelists. Overall, the narrative is beautifully written. French’s ability to capture the emotion of the moment and convey it to the reader is on point and at length. Told in first person by Detective Rob Ryan, you feel as if you’ve sat down for an interview with him, a secret conversation where he tells you things he can’t tell other people. It’s intimate that way, but it’s also deeply disturbing. Two crimes occur in Knocknaree, Ireland, one in 1984 (the disappearance of two children) and one in present time (the murder of a twelve-year-old girl). At first the crimes don’t seem related, aside from both occurring in the wood near town. Yet there is a big connection and his name is Detective Ryan, but his memory is shifty and his nightmares are vivid, so it’s only a matter of time before his secrets implode. There are only two negatives about this book. One, some of the narrative was too long. It’s important for us to be in Detective Ryan’s head, sorting through his memories and processing evidence, but sometimes his inner sermons were really long. Sometimes he conveyed important information pertinent to the crimes, but most of the time it was an emotional outpouring that eventually became unnecessary. We knew the guy was suffering. We didn’t need to continue beating that horse. Second, I had a pretty good hunch who was involved in the murder early on. I’m not sure if that’s because the character was too archetypal or if I knew it on my own senses. Still, I read most of the second half waiting to see how the character was going to be revealed, which I supposed was a mystery inside the mystery. Other than those two things, the book was thrill. Next up: The Execution of Noa P. Singleton. Buy In the Woods here.